Welcome to FontFreak.com, one of the largest and most visited freeware and shareware font sites on the net. Here you can download free fonts - well over 9000 of them - as well as purchasing over 125,000 commercial fonts. You will find thousands of free fonts to download from over 400 different designers. Most fonts have a PC and Mac version. The fonts are sorted alphabetically for easy downloading. There are free cursive fonts, calligraphy fonts, cool fonts, graffiti fonts. All dingbats are in true type format. New fonts are added daily. If you need font software, be sure to visit the software section for the latest updates. Font editors and font managers available for download. Free trial versions available. Please check the FAQ for font installation questions. Check out the new fonts page. The Font Creator Program puts font creation within the grasp of the average PC user, would-be typographers and graphic designers. With this application you can create and edit TrueType font files. You can use the modified fonts in Windows 3.11 and higher. Features include the ability to convert (scanned) bitmaps (.bmp files) to TrueType outlines, thus enabling you to create your own signature, logo and handwriting. In addition, unlimited undo and redo and repeat options are available. The modified fonts can be saved and then used in popular word processing and illustration programs. The enhanced transformation scripts let you create hundreds of additional characters in seconds. FontCreator's improved generation of composites, allows you to automatically generate outlines for more than 2,000 characters. The enhanced validation features enable you to improve the quality of your fonts. FontCreator comes with significant revisions to the manual kerning process, and much more. 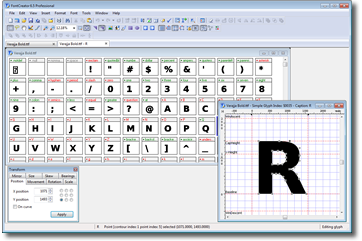 The editor lets you easily select any installed font, displaying the entire character set complete with descriptions of every letter, number, and special character. Once you've perfected your work of art, a click on the program's toolbar will install your creation.